The Post Direct business plan is unique, in that it develops a detailed plan for growing a newly started business through franchising into 25 outlet centers. Post Direct provides an excellent description of the process as well as the benefits of expansion through franchising. The following Executive Summary information is qualified in its entirety by the more detailed information appearing elsewhere in this business plan. The document is confidential and is one which can be substantiated by many years of ongoing work, extensive research, and experience of the Post Direct team of marketing experts. Address: 52 1/2 Burr Rd. Post Direct plans to be a chain of direct mail outlets specializing in the highest quality four color post card cooperative and solo direct mail in the nation. Post Direct consists of a high quality production demographically targeted to the best and most affluent of upscale markets. Post Direct is the Tiffany of direct mail. The outlets are targeted to be located in major metropolitan areas. The Company evolved out of Kingham and Associates Advertising, Inc., a full service advertising agency which is owned by John Kingham. Mr. Kingham is also president of that corporation. Kingham founded the original Post Direct outlet in May, 1992. He was assisted in The Company development by Benjamin Miller who joined the firm in September of 1992. Their first issue was published in November, 1992. Additional issues were published in March 1993, May 1993, September 1993, November 1993, March 1994, May 1994, September 1994, December 1994 and April 1995. Post Direct was incorporated on September 3, 1993. The chain now consists of one corporate outlet in Silver Spring, Maryland which serves the Washington metropolitan market. Locations for the Post Direct outlets are planned in prime metropolitan areas to attract upscale customers and generate high sales. The demographics include the 30 to 64 year old adults with household incomes of $75,000 and up, where applicable. John Kingham and Benjamin Miller perfected Post Direct to the point that it has become one of the best direct mail companies in the National Capital marketing area. Easily manageable and profitable, this particular business appeals directly to the now displaced business and professional persons who want to be in business for themselves but not by themselves. They continue to capitalize on the ever-growing demand for quality and effective direct mail opportunities, knowledgeable service and competitive prices. The Company will market its products through a network of approximately twenty-five (25) outlets. The Company has developed a concept of truly excellent quality direct mail pieces at competitive prices. Post Direct has gained a reputation of originality and good service resulting in high customer loyalty. What makes The Company unique is its ability to offer four color high quality production, a post card format, and effective marketing for cooperative and solo direct mail. The Company is self financed and is providing the required investment for its franchising development. Start-up investment for Post Direct outlets, corporate or franchised, will range from $21,000 to $27,000 depending upon location. 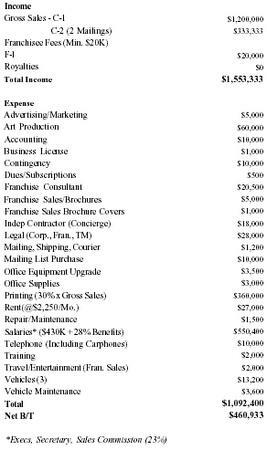 Franchised outlets will include these same start up costs plus a modest franchise fee ranging from $20,000 to $75,000 depending upon the marketing areas being considered. The costs for developing the corporate and franchise expansion are projected to run from $250,000 the first year, to over $500,000 the third year. One of the additional corporate outlets will serve the Alexandria, Virginia market and the other will serve the southern Georgia market. Development funds will be used for normal developmental and administrative expenses including legal, franchise sales, training and operations manuals. The key to marketing direct mail is name recognition. For this reason, it is recommended that Post Direct continue to develop its own marketing, design, promotion, and advertising techniques. This requires a considerable investment of capital for advertising and promotion purposes. After years of experience in advertising, radio, and direct mail management, along with designing instincts, copy expertise and marketing abilities, the time is perfect to exploit the Post Direct concept. The future expansion of Post Direct will be controlled, yet speedy. Money will be needed for marketing and promotional needs. In moving into new market areas, The Company will be highly selective of its franchisees in order to effectively develop the key marketing areas which fit the company's growth criteria. 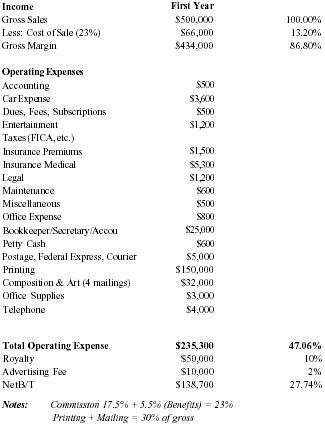 When all 25 franchisees operate for a full year — royalties will amount to $2,000,000 per year. Post Direct will use the franchising method of marketing to attract prospective franchisees and to duplicate the Post Direct system nationwide. The franchise is competitively priced, easy to operate, and profitable. For this reason, prospective franchisees, who have longed to be in business for themselves, but not by themselves, will be attracted to the concept. According to the International Franchise Association's (IFA) Franchise Opportunities Guide (1994), over $804 billion in sales were registered in franchising. This represents about 40.9% of all retail sales. Total franchise sales could reach $1 trillion by the year 2000. One out of every 12 business establishments is a franchised business. Homes are bought and sold through franchised real estate companies. These same homes can be cleaned, painted and carpeted through a franchised business. Cars can be purchased, tuned, and washed through franchises. We can have our hair cut, clothes cleaned, pets cared for - all in franchised businesses. We can travel from one area of the world to another through franchised businesses. Franchising, according to IFA, is a method of doing business. It is a method of marketing a product and/or service which has been adopted and used in a wide variety of industries and businesses. The word "franchise" is a French word meaning "to be free." In this sense, franchising offers people the freedom to own, manage and direct their own business. However, as with any freedom, there are responsibilities. In franchising, these responsibilities have to do with the franchisee's commitments and obligations, usually spelled out in a franchise agreement of contract, to the franchisor. The franchisor is the one who owns the right to the name or trademark of the business. The franchisee is the one who purchases the right to use the trademark system of business. In 1992 there were approximately 558,000 franchisees. Today, there are over 3,000 American franchisors (all types) and another 1,000 to 1,500 franchisors operating in other countries including Canada, Great Britain, France, Italy, South America and Japan. There are now over 558,000 franchisees in the U.S. generating over $803 billion in sales accounting for 40.9% of all retail sales and employing over 8 million people in nearly 70 industries. A new franchise opens in the U.S. every 8 minutes, according to the IFA. The franchise system works. Beginning in the 19th Century, the franchise concept was born when the Singer Sewing Machine Company provided the Singer name and inventory to dealers internationally. History has shown that the chance of success for a franchised business is significantly better than for other independently owned businesses. According to the U.S. Small Business Administration, nearly 65 percent of individual start-ups go out of business within the first five years of operation. 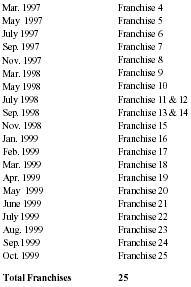 By contrast, since 1971 less than five percent of franchised outlets have been discontinued each year. It should be noted that franchising finds its largest growth in times of recession and/or down sizing. When executives lose their positions as the economy slows down, they become attracted to franchising and the opportunity to be in charge of their own destiny as franchisees. Although attractive to America's advertising specialists, Post Direct outlets are also an excellent investment for the sophisticated business person. Such people have the business acumen to recognize that franchising has matured and that it is attracting investors interested in building a successful track record. With Post Direct, an individual can achieve his dreams of creating a successful business by working smarter with less overhead and greater profits. According to what is being written in the various trade publications, the market potential for direct mail marketing is excellent. It is growing at the rate of 35 - 40% per year according to the Direct Marketing Association. John Kingham and Benjamin Miller combined their sales and management expertise with their knowledge and prominence in the field of advertising and cooperative direct mail to open their first corporate outlet in November of 1992. This combination of experience provided a unique growth opportunity. From their original outlet they now plan to expand to a network of twenty-five (25) franchised outlets in the United States. This expansion program is possible because they have built up an experienced team that is knowledgeable in advertising and cooperative direct mail media, as well as responsible for the development of the franchised outlets. The Post Direct concept began when John Kingham was heading up his successful full service advertising agency in 1988 — Kingham & Associates Advertising, Inc. John recognized the unfilled needs of the discriminating customer who does not always want to shop in department stores or shopping malls for their needs and/or desires, nor do they want their fingers do the traveling through the Yellow Pages. To fulfill this consumer need, Kingham and Miller introduced Post Directs pilot outlet in November, 1992. 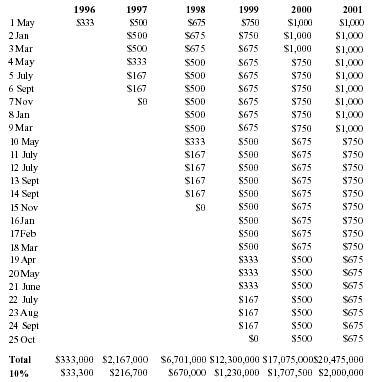 In 1994, The Company has generated $797,000 in sales, in 1995 it is projecting $825,000, and in 1996, $900,000 in sales. The Company plans to satisfy customer and consumer needs through the development of a chain of franchised outlets specializing in high quality, cooperative direct mail services. The outlets will be located in major metropolitan areas. The Company's mission is to open a network of twenty-five (25) outlets to be recognized nationally as the highest quality cooperative direct mail company, while also meeting the advertisers solo direct mail needs in an atmosphere where they will receive the ultimate in service at attractive prices. In a sense, The Company's goal to be recognized as the most unique creator and marketer of cooperative direct mail in the United States. Further, The Company has developed a sophisticated cooperative direct mail development and promotional system for its franchised outlets which allows for the continuous growth of the system without franchisees having to deal with the day-to-day problems of research and development. The Company's current foundation will allow it to capitalize on its potential. The expansion of the franchise system will be national in scope. Management, client selection, and cost controls will be keystones to The Company's success. The services will be provided by knowledgeable, well-trained and educated management, advertising, marketing and sales personnel. The Company has developed a well designed prototype outlet which will be emulated throughout the franchise system. Post Direct has proven itself to be an effective cost efficient direct mail advertising vehicle in a highly competitive market in the Silver Spring marketing area. Post Direct's prime objectives are to maintain its leadership in providing consumers the highest quality products and services through its network of corporate and franchised cooperative direct mail specialty outlets. Go public with The Company or be acquired by a major company. The Company's sales, management, and production expertise is in building long term relationships with their customers through superior marketing and graphics designed to meet clients' marketing needs. The strategy Post Direct employs for meeting the competition includes continuous research and development of product selection, marketing, and service. Post Direct will conduct a continuous analysis of customers' wants which will be done by knowing which products are and are not moving in the American market. The Company is on the cutting edge of advertising and cooperative direct mail in the United States. It knows what is "hot" and what is not. Post Direct's network provides the latest style and copy designs. The Company's current short range strategic planning for the next twelve months includes a well-developed franchise program, a complete financial control system, and a marketing organization trained to recognize, attract and sell potential franchisees. Long range planning - three to four years - includes implementing the franchise development program. The Company plans to complete its franchise agreement and UFOC and register the franchise in the following states: Maryland, Virginia, New York and Georgia. Once the franchise is developed, a comprehensive public relations campaign will be undertaken to augment the controlled growth of the franchise system. The Company has filed applications service mark material for the franchise to be registered with the U.S. Patent and Trademark Office (PTO). The selected products offered by The Company cater to a wide variety of consumers of upper income levels. To implement U.S. market penetration, The Company is prepared to invest the dollars and staff time required to develop its corporate and franchise expansion program. The Company was founded in May of 1992. The Company markets over 100 products. John Kingham is the founder of Post Direct and he is also President of The Company. Kingham has a proven flair for printing design, color and knowledge of cooperative direct mail advertising production. He was also President of Kingham & Associates Advertising, Inc., which billed in excess of $3 million for radio, television and print advertising by its second year of operation. While President of this advertising company, Mr. Kingham developed a vendor-supported television/print campaign for the largest furniture store on the East Coast, and this campaign became a nationwide model. The account increased sales during the promotion by 200% and broke all previous fourth-quarter records in the Florida market. Kingham's background also includes: Local Sales Manager, WBOR Radio; Account Executive, KLZQ Country; Account Executive WASL Radio; Equity Owner/Sales Manager, WSKP Radio; Account Executive, Weigand Agency; and Account Executive, Atlas Newspapers. Kingham has combined his sales and management expertise with the knowledge and prominence in the field of advertising and cooperative direct mail marketing to open his first Post Direct outlet. He worked his way through advertising and has developed an expertise in: merchandising, marketing, financial controls, advertising sales, and management responsibilities. Through his years of experience, Kingham has developed a reliable list of reputable advertisers. This combination of experience provided a unique growth opportunity for his company. As a result of his management, sales and advertising expertise, Kingham has expanded by opening a second outlet in the Georgia market, and is planning a third corporate outlet in the Alexandria, Virginia market. His responsibilities in The Company include general management, general overview of the operations, identification and selection of new franchise sites, concept design and merchandise promotion. John Kingham is married. He and his wife have two children. His hobbies include: golf, gym, and bicycling. He is also active in children's soccer and basketball. Benjamin Miller is Vice President & Secretary of Post Direct. He joined The Company in September, 1992 to help build it into the nation's foremost innovative cooperative direct mail company. In 1990, he was the advertising general sales manager for Sunshine Broadcasting, WDCB Radio. In 1976, Ben joined with Earl Polk Radio (WMAL/WWLA) where he was involved in sales, news continuity and copy writing. In addition, he has held the following positions: CBS Radio, KWT Radio where he was the top retail salesperson; Rocky Radio, WPAL Radio where he quadrupled billings in three months; Citywide Radio, WRST Radio where he became number one biller; Overboard Broadcasting, WAEI Radio, where he was national sales manager and then promoted to local sales manager. Miller received his B.A. in Sociology at Oxford University, with additional coursework in Communications and Journalism at the University of Michigan. Miller studied German at the University of Salzburg in Austria. He brings additional training to Post Direct by having attended: Sterling Institutes' "Managing for Performance"; Herb Cohen's "You Can Negotiate Anything"; RAB radio marketing seminar at the Wharton School of Economics; and Dale Carnegie's sales seminars. Benjamin Miller and his wife have two children. His hobbies include mountain biking, hiking, fishing, screenwriting, and restaurant reviews for public access TV. The Company enjoys many of the technologies of modern management and advertising methods. Production, marketing, sales, advertising and promotion, operations, administration, and training functions are effective on-going corporate disciplines which are being utilized as The Company is in the process of developing its franchising program. It expects to sell its first franchise by January, 1996. The Company is proud of its operations manual which has been developed over the past two years, and includes sections on Research and Development, Accounting, and Marketing. As the cooperative direct mail advertising market becomes more and more sophisticated, Post Direct maintains the basic business skills necessary to operate at the high levels of development and profitability. While it is important to be a good salesman and to properly promote merchandise, management, budgeting, continuing research and development are just as crucial to the bottom line. Until at least three franchised units are sold, The Company's current corporate staff, with the addition of outside consulting and legal assistance, will utilize a portion of its time for the development of the franchise system prior to hiring any new personnel. The nature of the jobs listed below will be subject to change as the system grows. The corporate staff is now working to establish corporate and operations policy criteria and specific job descriptions prior to bringing new personnel on board. There is a large turnover in the corporate world of franchising. The Company will avoid the possibility of inheriting the mistakes of unsuccessful franchises by making certain that its own style of operation and management remains unique, befitting its own image. Everyone at The Company is made aware of the commitment it will take to build a solid system of corporate and franchised outlets. The President, in conjunction with general responsibilities for corporate and operations policy development, is responsible for the overall management of the business and its growth. He establishes corporate policy, performance standards and incentives. Corporate office performance and outlet performance is monitored by him, and his feedback provides encouragement and increased productivity. He is responsible for new franchisees approval, outlet marketing, and client selection. He is responsible for the development of the Corporate staff and for the overview of franchise development. He addresses the annual meetings of franchisees, designed to facilitate the exchange of ideas and techniques between corporate officers, directors, and managers. The Director of Franchising is responsible for attracting, qualifying and selling potential franchisees. He directs the corporation's franchise advertising and promotional efforts for obtaining franchisees. He is also responsible for any franchise trade show participation on behalf of The Company. The Director of Operations is responsible for developing the franchise into a turnkey system, overviewing the franchisees, monitoring resolutions of franchisees' problems, and visiting franchised outlets. The Director of Operations' primary responsibility is to monitor the expansion and development of the franchised outlets. He is involved in monitoring the pre-opening and opening procedures, start-up inventory, and franchisee training. He is also available as a technical resource person for corporate outlet managers and franchisees who have specific operational problems or questions. As his responsibilities grow, a Director of Training will be added to the operations department and will take on the responsibility of training and development to allow the Director of Operations to assume his increased responsibilities as the system grows. The Marketing Manager is responsible for outlet sales strategies, point-of-sale materials, advertising programs, special promotions, and cooperative advertising strategies. He works directly with corporate outlet managers and individual franchisees in developing cooperative advertising strategies. This responsibility will remain the President's responsibility until such time that The Company can hire a full time Marketing Manager. Franchise Counsel is responsible for preparation of the franchise agreement, the franchise disclosure document, formation of the franchising corporation, filing and maintaining integrity of Trademark and Service Marks registrations, filing franchise registration in states requiring registration, filing the franchise in business opportunity states which do not have franchise registration requirements, and providing a system of franchise law compliance for The Company. Corporate Counsel is responsible for the general legal concerns of the corporation. This may include TM registration and compliance, if qualified. The financial advisor will be responsible, with The Company's comptroller, for providing a computerized system for inventory and sales controls, the corporate audits required for inclusion in the disclosure documentation, reviewing the performance income and expense projections, and providing the financial ratios essential to assist in franchise sales and to conform with FTC rules and regulations. The cooperative direct mail advertising business is included in Standard Industry Code (SIC) as follows: SIC 275 — U.S. Commercial Printing Industry is an over $60 billion industry which includes over 37,000 business establishments. According to the Direct Mail Advertising Association (DMAA), the direct mail advertising segment of the industry represents $23 billion with a 35 - 40% annual growth. The industry is affected by the nation's advertising budgets which increase 3.5% annually. The industry not only serves a growing aging population (60 years and older) but also a critical population group of persons aged 19 to 44, which is expected to remain unchanged at the 107 million level through 1996. The size and vast power of this group is highly attractive to the direct advertising business. The year 1995 began with the nation's economy in very moderate growth. However, by June of 1995, expectations of a mild recession is very much the concern of economists. Though softness is expected in some areas of the economy, moderate growth on balance is in prospect for 1996, and this augers well for the U.S. economy and is a good omen for the future of Post Direct. Industry publications and trade associations include: Direct Mail News (largest weekly update); Target Marketing; Response TV; Marketing Tools; Electronic Retailing; Telemarketing; National Direct Mail Advertising Association; and National Informational Marketing Association. The U.S. Industrial Outlook - 1994 lists that the major sources of growth are likely to stem from a pickup in consumer spending, recovery in producers' durable equipment and residential investment, and continued gains in exports. Personal consumption expenditures account for the largest share of the forecast gain in real GNP in 1994. A relatively stable inflation rate and a slight increase in interest rates are forecasted for 1994, implying a continuation of accommodative monetary policy. Expected white collar increased employment should lead to increased cooperative direct mail advertising. In addition, larger numbers of senior citizens and retirees with higher disposable incomes should stimulate more travel and corresponding increases in direct market advertising sales. Post Direct's market is defined as nationwide. One Post Direct outlet can serve as many as 200,000 households consisting of 30 to 69 year-old adults with an average household income of $75,000 per year. The Company's market, where applicable, includes the upper-middle and upper class consumers. It is interesting to note that the 25-44 age group is projected by the Census Bureau to total 82 million people in 1994, or one-third of the total population. The 45-54 age group will be among the fastest growing, increasing at an annual rate of 3.6 percent between 1992 and 1997, compared with only 1 percent for the total population. It is a known fact that coupons and card users increase with age. This is an excellent selling tool when talking with advertising clients. According to TRW, Target Marketing Services' highly affluent consumer database included 5,716,692 households nationwide and is generated from a TRW income model to identify consumers with $100,000+ income. It is processed through national change of address, and reported by two or more sources for the most accurate and deliverable source of demographic information available. The Company is in a positive growth situation. Other competitive cooperative direct mail advertising companies have entered the market, however, because of Post Direct's unique promotion and marketing ability, The Company enjoys its high-end leadership position in the National Capital marketing area. It expects to do the same in the additional marketing areas it adds to its system. As the economy improves, other competitors will enter the market. However, this will keep The Company competitively alert to maintain and increase its market share. Why do consumers like and use cooperative direct mail advertising? In the 90s, cash is king. Consumers want a better deal in the form of service, quality, dependability, — and, especially, a discount on price. For many consumers, Post Direct offers the hope of affording high-quality products and services at reasonable and discounted prices whether the advertisers choose a "solo" ad, criss-cross marketing ad (card swapping), network marketing, or direct customer marketing. With the right advertiser mix, plus old and new ways to attract and keep customers, Post Direct maintains its position on the cutting edge of direct advertising sales. The recession of the '90s resulted in new shopping strategies for the 30-50 year-old age groups which began to target deals on quality goods and services. Direct response advertising is the call of the '90s and will continue to expand in other fields in the early years of the twenty-first century. Sales via FAX, computer/electronic networking, and cable TV will be on the increase over the next five years. However, this particular growth should not affect Post Direct because electronic and/or TV responses are not measurable — as is Post Direct. 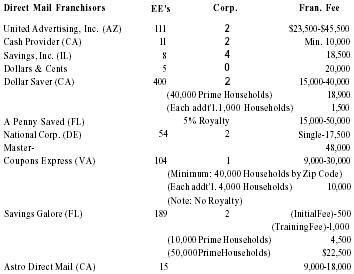 There are over thirty (30) franchised cooperative direct mail advertising companies in the United States. The market trends look promising for The Company. Although competition is increasing, Post Direct is one of only two direct mail companies that targets high-end consumers for high-end advertisers with ad agency quality creativity. Post Direct continues to work this special niche by marketing its services. Most direct mail companies concentrate on the low-end advertiser such as pizza parlors, gas stations, dentists, etc. and cannot crack the market Post Direct now holds such as jewelry companies, Mercedes Benz dealers, resorts, fine clothing outlets, etc. Post Direct now excels in gross billings, quality customer base, renewal rates, promotional events and additional specialized direct mail techniques including solo mail, criss-cross marketing, networking mailing, customer mailing, and private sales. The opportunities for expanding the U.S. market will be dependent upon The Company's ability to transfer its product knowledge and marketing capability to its individual franchise owners. This requires a considerable investment in maintaining "state-of-the-art" prototype outlets, sales promotion, and effective communication with franchisees. Many mainstream advertisers have not realized the benefits of co-operative direct mail or solo direct mail for their customer base. High-end advertisers, joining forces with other high-end advertisers, to share a Post Direct mailing to high-end consumers can present the best of images with high quality four-color cards at a lower cost, yielding fabulous results. The United States has created the specialized cooperative direct mail advertising business that makes a variety of specialized goods and services available to the consumer through the mail. The current demand for high-quality merchandise and service via cooperative direct mail has given new life to the cooperative direct mail advertising business. Direct mail fills a niche, offers convenience and personalized service to the consuming public, and will continue to flourish. Increasing amounts of advertising space is being used by cooperative direct mail. Post Direct is already at the cutting edge. With the sheer multiplicity of goods and services options, the buyer's problem of choice has become complicated. The addition of each new item creates the need for more information, more decisions and more sub-decisions. Post Direct, with its specialized advertising approach, reduces the consumers learning and shopping time by providing a well informed sales package to the consumer, directly to his home. Post Direct provides its users more sales and more profits. Post Direct provides consumers quality goods at non-inflated competitive prices, which is the hallmark of our free enterprise system. Post Direct leads the pack in quality, direct-response publishing, increased sales and reduced costs. There are so many direct response card mailings that it is sometimes difficult to separate the champions from the others. With Post Direct, however, no such problem exists. Post Direct leads the pack. The Company will continue to develop and expand its specialized up-market cooperative direct mail concept, and super competitive pricing. The Company will serve an important role in the world of cooperative direct mail advertising by providing consumers with the option of simply buying fine products at the best price. By maintaining its knowledgeable sales staff, which is constantly trained in selecting up-market products to promote, and concentrating only on quality products and services, The Company gets repeat and satisfied customers. Post Direct often hears from its customers that it is "the only direct mail medium we use because it (Post Direct) is differentiated from other direct mail companies in that Post Direct works only with the area's finest retail outlets, resorts, and other best names in advertising." Post Direct attracts the finest businesses, which are not included in our competitor's packages. Post Direct attracts advertisers who never considered participating in other direct mail packages that many customers consider "trash." The advertising client knows he is best served by Post Direct. The upside potential for The Company's growth over the next several years is the reputation enjoyed by The Company in the Silver Spring area because of its selection of customer groups and the personal attention in growth and quality control provided by The Company's principals and management team. These will be major selling features for Post Direct outlets. From high-end advertising clients to high-end consumers - this is Post Direct's service mark. The Company has the reputation of bringing a wide variety of cooperative direct mail advertising to the public. Post Direct's sales rose quickly since The Company started its marketing operations in 1992. The Company's distinct advantage over the competition lies in its experienced management, marketing, and sales team - making any Post Direct outlet a very formidable competitor. The Company is recognized as the "creme de la creme" in the cooperative direct mail advertising business. It excels in numbers and types of customers. It enjoys market area recognition wherever it has an outlet. It is known for its high quality visibility and its select list of advertisers. Post Direct already enjoys customer recognition. The Company is already sought after as the direct-response publishing outlet. The Company is in an enviable position for opening future outlet locations. The Post Direct franchised outlets will be unique in their concept and their graphic appeal. Direct competition in the up-market segment is virtually non-existent. The Company's product selection, pricing and accessibility have played a major role in filling a niche for quality merchandise and services. Pricing of the cooperative direct mail advertising products reflects the uniqueness of Post Direct's method of delivering quality and exclusivity. Although the gross profit margins are higher than the cooperative direct mail industry standards, Post Direct clients do find good value. This is achieved by the extensive on-going market research which identifies quality advertising approaches at the best possible price. The cooperative direct mail response business is a growing market. This is due to the fact that magazine and newspaper advertising is a shrinking market and the cooperative direct mail is a niche which serves the Post Direct recipients. Post Direct keeps abreast of what the upper-middle class and the upper class of clientele wants. This policy helps keep the consumer aware that Post Direct is "the place to buy quality merchandise and service." The Post Direct franchise concept is designed to be a profitable investment for the franchisee. It will be up to The Company's management, purchasing and marketing abilities to acquire and maintain a fair share of the direct mail advertising market. Since The Company has a narrow marketing window, locating the areas with up-market buyers is a top priority. The Company's sales organization is recognized for targeting its markets. The Company's Franchisees make friends with their customers and serve them cheerfully. Even when the customer does not make an advertising purchase, he is always treated like a friend. Competition in the cooperative direct mail response industry are mainly from over 1150 franchised outlets. The more formidable competitors include: Dollar Saver; Coupons Express; and Savings Galore. Most cooperative direct mail companies concentrate their efforts on lower quality goods aimed at the low to middle markets. The major weakness of these competitors is their limited range of up-market products, coupled with a lack of publishing knowledge, marketing and personalized service. As revealed in the Financial section of this business plan, The Company plans a two tiered growth — one in the area of franchised outlets, and the other through corporate outlets. It is projected that The Company will open its first franchised outlet in 1996. It is further projected that The Company will have a total of twenty-five (25) franchised outlets by the year 2000. At the end of 2000, The Company's growth rate will be reappraised. The Company bases its success on sales ability. Therefore, the company will seek prospective franchises among advertising practitioners, sales managers, and sales professionals. In addition, it will seek corporate refugees with sales experience. The Company will use the business format franchise, which is characterized as an ongoing business relationship between the franchisor and the franchisees. This includes the products, trademark, and service marks, as well as the business concept, which includes a marketing strategy and plan, operations manuals and standards, quality control, and a continuing process of assistance and guidance. The key strategy for The Company's growth is to develop, over a period of five years, a network of franchisees in at least 25 major markets in the United States. It will allow for the synergy needed for rapid expansion. To identify, attract and better serve its customers, The Company will search for prospective franchisees who are currently in the following professions: radio sales and management; direct sales and management; newspaper and magazines advertising sales; advertising agencies; and printing, marketing, and direct mail. As countless salaried employees have turned to entrepreneurship, driven by a dream of independence, many find that going into an independent business is risky. With a well qualified franchisor who has researched, developed, and successfully operated the business he is franchising, the franchisee's risk and investment is lowered considerably. It is also widely known that customers, particularly up-market products and services buyers, prefer to be served by knowledgeable and qualified people. In most businesses, the one managed by its owner will out-perform the same business or a competing one managed by a non-owner manager. Trained in all aspects of outlet operations, the franchisee will be provided a thorough knowledge of The Company's method of operation and will be supported by continuing services. The franchisee should be able to realize a good profit from his investment. Capacity to reach the highest income people in his market with 50,000 to 200,000 mailings. The Company's objective is to have three corporate outlets by January 1995 and twenty five (25) franchised outlets by the end of 1998. This will be twenty eight (28) total outlets. It is recommended that Post Direct outlets be located in the top fifty high-density up-market areas in the United States. The franchised units can be operated out of the franchisees' homes. Developing a vibrant image and commitment to friendly and efficient service. Every business which sells advertising is a competitor. Every company which sells the same or similar services as Post Direct is a competitor. Every newspaper and magazine is a competitor. Every radio and TV station is a competitor. However, what makes Post Direct unique is that unlike most businesses that sell advertising, The Company specializes in quality merchandise and services available at competitive prices and sold directly into the homes of the buyers. Post Direct customers' goods and services ads are carefully prepared, merchandised, and attractively presented to the consumer. The consumer appreciates the speed, the convenience, and the knowledgeable and friendly Post Direct service. This is what makes Post Direct different and successful. Post Direct concentrates on the middle and high-end advertisers and offers a combination of services. Although Post Direct considers competition to be other direct mail companies and daily and weekly newspaper advertising, Post Direct is secure in that it offers unique and quality advertising services. This separates Post Direct from its competitors. Actually, there is little direct competition with Post Direct. Anyone wanting to compete with this concept in the up-market category would have to be prepared to risk anywhere from $500,000 to $1,000,000 on development costs alone. Post Direct took years to develop and hone the profit machine it is today. Post Direct is an excellent investment for the sophisticated business person interested in selling to America's upper-middle class and upper class. Post Direct's innovative development techniques are attracting well capitalized veteran business people who have the capacity and the capital to develop a Post Direct franchise in their metropolitan area. They have the business acumen to recognize that franchising has matured and that it is attracting investors interested in building a successful track record. An entrepreneur can achieve his dreams of creating a Post Direct outlet and being in business for himself but not by himself. Initially, Post Direct began with one corporate outlet. Through this outlet, Mr. Kingham was able to provide research, development and training which allowed him to expand the network into two corporate outlets, and an expectation of expanding the business through twenty-eight (28) outlets including three (3) corporate outlets. The Company's primary markets are the upper-middle and upper income managerial/professional and retired individuals with disposable incomes. The Company will solicit customers who can emphasize products wanted and/or needed by consumers in this market segment. The Company will ensure that its franchisees are highly trained to attract new customers and that its service is rendered efficient; and that its customers are treated in a friendly, courteous and professional manner. As franchisee customers' new product lines are introduced, updates will be sent to Post Direct's outlets to secure similar customers in their respective marketing areas. The Company will monitor and analyze competitive ads. Although nurturing its current marketing niche, The Company is constantly monitoring its competitors, and maintaining its research and development acumen to bring new products and services to the markets. Markets are studied according to need and changed according to the market demands. Post Direct customers perceive the company as number one relative to competition. Consumers perceive Post Direct's products to be of a higher quality than competitive products. Post Direct will maintain and strengthen its marketing position, which creates even more confidence and trust regarding The Company and its customers' products. The key to marketing is to link the outlet with the name of the franchisor — "Post Direct." This requires a considerable investment of capital for advertising and promotion purposes. After years of experience in advertising, Mr. Kingham with his advertising instincts and abilities, the time is perfect to exploit the "Post Direct" concept and make the statement "Post Direct" deserves. Post Direct currently utilizes its own staff for the development of advertising materials. Among the trade publications in which The Company plans to advertise its franchise availability will be trade shows, newspapers, Wall Street Journal, USA Today, Fortune, Advertising Age and others. As The Company expands, it is possible that an inside Public Relations person will be added to staff to develop trade and public press stories and to handle other public relations projects which will help generate interest in the network's outlets. There are several realities that every developer of a franchise or business opportunity must face in order to be successful. The first reality is that there are many business opportunities competing for the potential investor's dollar. The second is that the franchisee must prosper if the franchisor is to prosper. If Post Direct is to establish itself in the U.S. market, a broad-based marketing strategy must be undertaken. This strategy must promote the image of the Post Direct network and raise the awareness of Post Direct products and services availability not only in the marketplace but also among potential franchisees. This is particularly important in view of the fact that it will require a major public relations and advertising undertaking to "sell" the Post Direct concept in spite of competition. The advertising and promotion objective is for the Post Direct outlet owners and/or managers to reach 50,000 and/or 100,000 targeted consumers in the specific marketing area where franchises will be established. In the majority of cases, the prospective franchisee is looking for an opportunity to achieve financial independence and career satisfaction with a minimum investment in time, money, and risk. His primary motivation is money, since money can provide him with most of the things he does not now have but does want. His primary fear is that of failure. The real reason that he is shopping for a business is out of his belief that the grass is always greener on the other side. This is supported by the assumption that the only way to get rich is by being in business for yourself. What he will buy is a program that presents products and services in an area that is not overworked by the competition. He will buy a program like Post Direct because it will provide him with all the tools, training, support, and track record required to create a confidence level high enough to minimize his financial risk. The prospect's decision to buy a Post Direct franchise will be largely controlled by the impressions made by the first presentation. The importance of giving him an exceptionally high confidence level about the business becomes very clear. Keep in mind that Post Direct will not likely be the only business opportunity the prospect will consider. The initial presentation should provide the prospect the feeling that Post Direct is a substantial company with extensive experience in the business. The presentation and supportive materials must instantly build the credibility needed to gain the prospect's confidence in the value of the offer and the ease with which they can succeed. There is an old business expression that states, "Anyone can sell a superior product, the only difference between salesmen is the number of presentations it takes to make that sale." A large percentage of the ultimate profitability of selling any business opportunity lies in the cost of selling the package to your franchisee prospect. The cost of promoting sales of the franchise mounts up quickly, whether it includes trade press advertising, newspaper advertising, trade shows, local seminars, hotel rooms, airfare, manpower, etc. Regardless of how good ads might be, only so many people will call for more information or request an invitation to a local seminar. What are my chances to succeed with you? And, are there any better alternatives? With these questions in mind, it quickly becomes obvious that the initial presentation and all of the materials the prospect receives must excite and motivate him to the genuine potential offered by your business. The presentation must also provide evidence attesting to the quality of the product and the company, as well as overcome any fears that he may have about taking the next step to become a Post Direct franchisee. Suggested promotional elements fall into two major areas: franchise development sales materials and franchisee support materials. Each serves a specific need, and each contributes to the ease with which the franchisor can convert the initial opportunity into a franchise sale. This includes a basic franchise brochure designed to be used as a straight handout or as an invitation to a seminar. It simply tells of the exciting opportunities offered by The Company and how easy it is to become successful as a result of the program offered by Post Direct. This is a romance piece designed to touch on the financial needs of the prospective franchisee, and to show how The Company's program can afford him the independence he is seeking. This piece is very competitive in nature. It will be the most read piece of literature the franchise prospect will take away with him. It should be a quality piece to convince the prospect that Post Direct is a company of substance. It should be a slick, four color, fully photographed piece showing successful individuals using the tools provided and enjoying the profits from their labors. The copy and presentation must present the economics of the business along with an overview of the industry in order to overcome his fears, negate his tendency toward procrastination, and present the tangible financial rewards of the good life as a result of his decision to sign on. Newspaper or trade publication ads promoting the availability of the franchise need to be developed for insertion in local papers in areas where the company has decided to establish franchises. The basic ad should be approximately two columns, 75 lines deep, and designed to run in the Sunday, "Business Opportunity" section of the paper. A second insertion of the same ad in the Sunday, "Business" section would provide additional responses. This is a 9" × 12" portfolio. It consists of a folder with pockets inside designed to hold the franchise brochure, sample store layouts, magazine and/or newspaper ad reprints, local outlet/customer promotional pieces and ads, franchise application materials, testimonial sales letters, and newspaper or magazine article reprints promoting the positive nature of The Company. These are simple 8 1/2" × 11" black and white or color sheets of products, articles, references, and pre-printed pages of materials to be given the prospect at the initial meeting. It is recommended that a budget be developed for 10 to 15 different pages. Once Post Direct decides on the marketing method it wishes to employ in the U.S., Post Direct should conduct franchise sales seminars where prospective franchisees could be solicited. These "by invitation only" seminars would provide information in a group setting during week-end and evening hours about business opportunities through Post Direct. VCR or slide presentations can be used as a major selling tool for use at individual or group presentations. The presentation should be about 15 to 20 minutes in length and designed to set the mood, build the enthusiasm, and create the desire to participate in Post Direct's exciting program. The presentation will deal with the frustrations most people feel about achieving financial independence, and what it will take to achieve it. Initially, this program shows the need for being in business for yourself but not by yourself. It also covers the need to select the right business. It shows success ratios of franchises compared to failure ratios of the average untested private business. After establishing the success ratio, it considers the specific factors that makes Post Direct unique and potentially successful to the franchisee. Here the presentation points out the nature of the business, the lack of serious competition, the class of people the franchisee will be dealing with, and other desirable aspects of being a Post Direct franchisee. Once the emotional aspects are addressed, the presentation then concentrates on the fiscal aspects. It should include a brief history of the company, market penetration and dominance information, and product quality data. It should create a mood that Post Direct is not only the best direct mail advertising outlet but that it is the best company to be associated with. Finally, the presentation outlines the most important competitive element — that of Post Direct support. In this area, the presentation describes the support franchisees will get from The Company. This will generate a desire to become a franchisee, and the closing becomes easier as a result. By demonstrating franchisor support, the prospect loses the fear of his ability to sell The Company's products and services to prospective customers. The Company's objective should be to convince the prospect that he is buying marketing rights to superior products and services and getting a proven customer generating system as well. This includes materials provided by the franchisor and used by the franchisee to sell to the customer. These are the tools designed to make franchisee's selling easier. Remember, prospective franchisees are tired of being at the mercy of others. What The Company can assure him of is that he will not be at the mercy of his market with a Post Direct franchise. By providing franchisees with a proven customer sales campaign, The Company provides him with a credible, impressive, and effective way to reach a large number of potential customers. An initial Post Direct ad includes a four-color postcard that shows a spectacular new opening of another Post Direct outlet. It should be mailed to the targeted businesses in the franchisee's market. It is obvious that a great deal of what Post Direct has to sell is directly related to the promotional materials used to cinch the franchise sell. They are the tools The Company will use to sell its franchise. This segment of the company's franchise development should not be neglected, and could range in cost from $30,000 to over $50,000. Pricing is generally based on what the competition charges, as well as freight, marketing, promotion, and overhead costs. A fair profit for the franchisor and the franchisee, of course, must be taken into consideration. Pricing of advertising products is competitive, However, The Company can and does command a competitive price structure because of the high printing quality of its products and the volume of sales controlled by The Company. Customers are willing to pay a fair price for recognized quality product value coupled with good service. Because of The Company's buying ability, there is some elasticity in Post Direct's pricing structure, which can be brought into play when competition demands. In examining the cost of buying printing against current competitive prices, it is clear that there is adequate room for Post Direct to allow for competitive pricing. 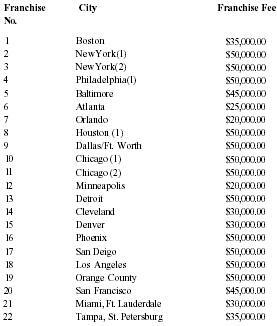 The franchised outlets are expected to maintain annual gross sales of $500,000 the first year, $675,000 the second year, $750,000 the third year, and $1,000,000 the fourth year. Franchisees will be required to maintain a performance gross sales target schedule. Even though Post Direct can initially be run efficiently from the franchisee's home, minimum space requirements will range from 400 to 800 square feet. The actual radius of operation for the franchise will depend on the population density, the income levels and the relative locations of other Post Direct franchised units. Post Direct is a prestige direct mail advertising specializing in selling up-market products and services. It is designed to serve major metropolitan areas. The ideal minimum population density base required for a successful franchised outlet is 1,000,000. Key criteria includes: high income levels of the population ($75,000 and up); sufficient office space; advertising expense; and public transportation availability of employees. The franchisee will be responsible for collecting demographic data from the state, city and/or county. These entities provide demographic data to those interested in doing business within his area. Industrial development commissions, local chambers of commerce, trade associations, newspapers and periodicals, trade journals, planning commissions, bankers and local libraries are all recommended sources of information to assist in site assessment. Additional specific demographic data can be purchased from demographic data service organizations at a reasonable fee. The Company will market its direct mail advertising services through a national network of franchisees. Franchises will be sold to individuals, partnerships, or corporations. The Company will market to individual franchisees with experience in sales and business management. The Company will use the business format franchise, which is characterized by an ongoing business relationship between the franchisor and the franchisees. This includes the products, trademark, and service marks, as well as the entire business concept, which includes a marketing strategy and plan, operations manuals and standards, quality control, and a continuing process of assistance and guidance. First, The Company needs to legally establish the franchising company. In addition, the franchising company needs to be capitalized and the capitalization certified. Next, it is recommended that The Company prepare its Uniform Franchise Offering Circular in accordance with the Federal Trade Commission's Rule regarding the disclosure of franchise sales. The Company will register the franchise company's name, trademark, and service marks in the federal register of the U.S. Copyright and Patent Office. The Company will also register the franchise in those registration states in which it intends to sell franchises. With a projected total of twenty-five (25) franchised outlets, the Post Direct concept lends itself to a single unit sale. Therefore, it is recommended that the franchise agreement be limited to a single unit. The franchise agreement will provide for the granting of the right of franchisees to use the Company's trademarks and service marks, as well as The Company's System and Business Format. It is recommended that the franchise fee range from $20,000 to $50,000 per unit based upon the size of the franchised marketing area. All fees are to be paid in a lump sum upon signing of the franchise agreement. The first franchised outlet will be sold at a token fee of $12,500 (to cover training). After the first outlet is sold, the franchisee fee will be a minimum of $20,000. The franchise fee is subject to change as additional units are sold. A royalty fee in the amount of nine percent (9%) to ten percent (10%) of the gross sales volume will be so defined in the Franchise Agreement to be paid to The Company on a per mailing basis. Under any circumstance, the required minimum monthly fee will be $500 per month. An advertising fee in the amount of two percent (2%), and not to exceed four percent (4%), of annual gross sales will be paid into an advertising/promotion fund to be used exclusively to meet any and all costs of placing, designing, maintaining, administering, researching, directing, and preparing general Post Direct advertising. 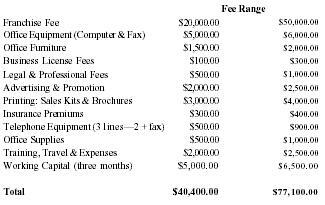 The fee will be collected and administered by The Company. The total investment of a franchisee for one Post Direct franchise outlet will range from $40,400 to $52,100 (including the franchise fee). The franchise agreement shall have a term of five (5) years with an automatic extension for an additional five (5) years. Upon renewal, the franchisee will pay a renewal fee equal to ten percent (10%) of the most current franchise fee. Post Direct has applied for the registration of its trademarks and service marks to protect them for the use by the franchisor and the franchisee. Post Direct will own all rights to the trademarks and the service marks of the System. The use of these marks is the cornerstone of the franchise, and The Company is dedicated and obligated to protect them. The trademark and service marks will also be registered internationally as required. Post Direct's franchisees will be granted the right to use The Company's trademark and service marks. It is recommended that Counsel be retained to protect The Company's trademarks, service marks, trade names and logo types through due diligence regarding their uses. In addition, any proprietary goods, equipment or service technology should be protected to allow The Company's franchisees to compete effectively in the marketplace and to deliver high quality advertising products and services. Franchisees will need an office from which to conduct business. The space required will range from 400 to 800 square feet. The location may be at the franchisee's home or another location. Franchisee is responsible for selecting the office location, for setting up the office and for operating the office, Franchisor does not specify nor approve the location of the franchisee's office. The franchisee must activate the franchise operation within 45 days following the signing of the franchise agreement. The franchisee will have completed his training in this period of time as well. The Company shall be the sole source of any direct mail co-op advertising products and services (art work, typesetting, printing, proofing, collating, etc.) These production services shall be made available to the franchisee at rates set forth in the confidential operations manual. The rates shall be subject to change as required by rising costs of labor, postage, mailing list, paper, and other materials and general administrative costs. Rate changes shall be made upon thirty (30) days written notice to the franchisee. Requirements include a minimum of two (2) mass mailings to at least 100,000 mailable homes in the area during the first twelve months of operation, followed by a minimum of three (3) mass mailings to at least 100,000 mailable homes in the area during the second twelve months of operation. The minimum number of mailings for the next year will be determined by the success of the mailings in the previous year. Controls are the essence of a franchise system, enabling it to produce a profitable operation. These controls are incorporated into the franchise agreement and the confidential operations manuals. A supervisory system has been established to give training, support, advice, and continuing services to the franchisee. The Company's system is designed to provide the franchisee with a profitable business format and a public acceptance of the concept wherever the franchise is located. Well-placed financial controls and reasonable cash requirements will enhance The Company's integrity, credibility, and commitment with and to its franchisees. The program of supervision is well documented in the Company's Franchise Agreement and in its operations manual, which explains in detail the payment of the fees, the franchisee's startup costs, and the rights of periodic inspection. The administration of the franchised operation and standards for products and services to be offered to customers is clearly documented in the confidential operations manuals. This complete guide to the operation of the franchise is available, on loan, to each franchisee. The franchisee is responsible for keeping his copy of the operations manual current. The master copy of the operations manual is maintained by the franchisor at its principal office and will be the controlling factor in the event of a dispute about the contents of the operations manual. To maintain identity, trademarks, service marks, and quality control, The Company provides a standards criteria and description of products and services currently sold through Post Direct. The Company will bring new products and services on line for the franchisee as they become available. Reference will be made in the Franchise Agreement pertaining to The Company's required approval of any equipment, product or services of the franchisee's which are not included in The Company's Operations Manual. The Company has designed its own forms to be used by the franchisee. With prior experience in outlet operations, the forms are designed to fit the operations System. A franchise can produce optimum results with well developed and executed advertising and promotional efforts. For this reason, The Company will maintain a well-tuned marketing program, the cost of which is shared with the franchisee through a required cooperative advertising campaign. This program includes: advertising, promotion, public relations, advertising copy, commercials, formats, and slicks. 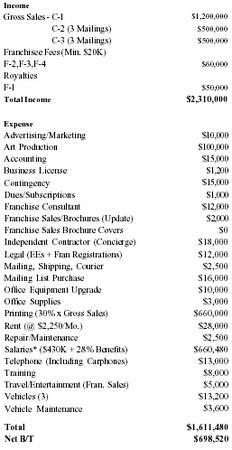 The advertising services and details of the franchisee's marketing program are detailed in the confidential operations manuals. Through constant evaluation of its competition, The Company, with the combined advertising power of its franchisees, will be able to find ways to better serve their markets and plan for the future. The company has established a standard chart of accounts and a uniform reporting system for its franchisees. This will be included in the operations manual. In addition, The Company will capitalize on the advantages of computer technology. Outside the obvious advantages of billing and payroll, financial statements, and cash flow analysis, computerized product purchase analysis can identify the best products and services for franchisees' customers. The franchisee and/or its approved manager are required to participate in the training program. The Company will distinguish itself through a personalized approach to training its franchisees in the state-of-the-art of operations, management and marketing. Well in advance of the franchised unit opening, the franchisees will each receive a copy of the operations manuals to read and review. The operations manual will remain the property of The Company. The Company is developing a comprehensive training program for franchisees to be conducted at its corporate headquarters and in operational facilities. The company training program is designed for a minimum of one week's duration at any one of the corporate outlets. In addition, one more week at the franchisee's site will be included in the training program. More time will be allocated if necessary. The training program establishes a solid base and does more than anything else in cementing a long-term and healthy relationship between The Company and its franchisees. The franchisee is solely responsible for the compensation, travel, lodging, and living expenses incurred by the franchisee and its employees in connection with attendance at any of the franchisor's training programs, conventions, and/or meetings held by the franchisor. Periodic seminars for all franchisees will provide an invaluable exchange of ideas, new programs, new product introduction, management updates, and marketing. Such meetings will give the franchisee information and ideas that can only be obtained through association with The Company. Franchisee is obligated to comply with franchisor's intermarket sales policy with respect to sales of advertising for the mailing of Post Direct Decks outside of the franchisee's territory. This policy is outlined in the operations manual. The Company will use its computer technology to keep franchisees ahead of the competition. For example, announcements of new products should be on-line for the franchisees within minutes. In addition, a periodic newsletter will be prepared at corporate headquarters and will describe relevant events including changes in tax laws, key economic trends special events of interest, important news items about The Company and its franchisees, and, of course, products and operations. The newsletter will serve as a sales incentive and communications vehicle. A franchisee and/or employee of the month will be established, sales records will be published, special achievements recognized, and management and marketing tips provided. Conformance to the franchise agreement and the standard operations procedures will be required by all franchisees. This will be accomplished through the Franchise Agreement, the operations manuals, and daily, weekly, monthly and/or annual reports and audits. Periodic inspection visits by a regional manager, corporate officer, or supervisor will reinforce standards of conformance. 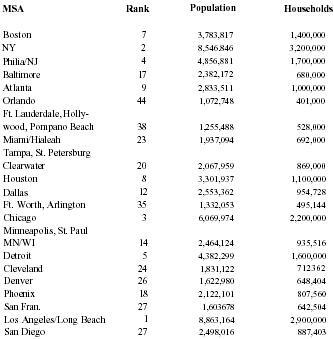 MSA — Metropolitan Statistical Areas as defined by the United States Department of Commerce. There are a total of 320 MSAs in the U.S. MSAs are constituted of entire counties in all but the New England states (Connecticut, Maine, Massachusetts, New Hampshire, Rhode Island and Vermont). New England's MSAs consist of cities and towns, and boundaries may include parts of several counties. NECMA's (New England County Metropolitan Areas), on the other hand, are constituted of entire counties. FTA (Franchisee Trade Area) — the boundaries of which are identified by the franchisor and agreed to by the franchisee. It consists of approximately 100,000 prime households in the $75,000 household income range. The FTA will be identified by counties, zip codes and/or natural boundaries for each franchise. Prime Households — those domiciles or households within the area deemed to be desirable recipients of Post Direct, based on reported households annual income and demographic criteria in accordance with the Company's policies and standards as outlined in its operations manual. Production — the publication of Post Direct "Card Decks" for a mailing, and all of the services performed in connection therewith, including but not limited to: graphics preparation, proofing, printing, collating, etc.